Planned Parenthood is going on the offensive with massive lawsuit. Anti-abortion protesters pray during a sit-in in front of a proposed Planned Parenthood location on Sept. 21, 2015, in Washington. Thanks to the Center for Medical Progress, Planned Parenthood spent the latter part of 2015 getting kicked in the teeth. The CMP’s highly edited undercover videos, which purported to show Planned Parenthood officials selling fetal organs, created a hurricane of terrible publicity and spurred political attacks across the country. Anti-clinic harassment shot up exponentially. 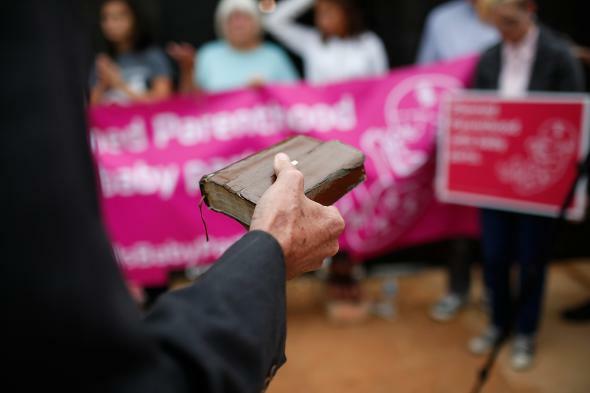 Protesters targeted Planned Parenthood doctors at their homes. Five congressional committees and eighteen states launched investigations. (Ten of those state investigations cleared Planned Parenthood of wrongdoing.) A madman ranting about “baby parts” murdered three people at a Planned Parenthood in Colorado Springs. Now, Planned Parenthood is going on the offensive. On Thursday afternoon, it announced a massive lawsuit against CMP, charging it with, among other things, violating the Racketeer Influence and Corrupt Organization, or RICO, act—a law originally used against the Mafia. The lawsuit seeks restitution for actual losses caused by CMP as well as compensatory and punitive damages and attorneys fees. It hasn’t named a dollar figure, but it claims that CMP’s actions have cost Planned Parenthood millions. Should Planned Parenthood prevail, it would be a profound economic blow to the anti-abortion movement. CMP wants to paint the suit as an attack on free speech. In a statement, the group called it a “frivolous lawsuit in retaliation for CMP’s First Amendment investigative journalism.” CMP may indeed have a First Amendment defense to at least some of Planned Parenthood’s charges, but the fraud and deception outlined in the lawsuit are not what investigative journalists do, even when they go undercover. In pulling off its anti-abortion coup, the suit alleges, CMP made use of fake driver’s licenses and fake credit cards. It stole the identity of one of founder Daniel Daleiden’s pro-choice high school classmates, Brianna Allen. * And of course, it registered a fraudulent tissue procurement company, Biomax. This case is not going to be resolved any time soon. The last time Planned Parenthood took on the anti-abortion movement like this was in the 1990s, when it sued 12 anti-abortion activists and two anti-abortion groups for creating “Wanted” posters targeting clinic doctors. That case dragged on for a decade, though it was ultimately resolved in Planned Parenthood’s favor in 2006. Whatever happens in Planned Parenthood vs. Center for Medical Progress, Daleiden and his colleagues have already been sentenced to a long, grueling legal battle. Correction, April 6, 2016: This post originally misspelled David Daleiden’s last name.